The meter was salvaged from an old CB. C1 is selected for required meter damping (say 50-100uF). All diodes ars germanium. Typical calculated values for Lx are: BOm:lmH, 4Om: 180uH. 2Om: 47uH, I5m:l8uH. 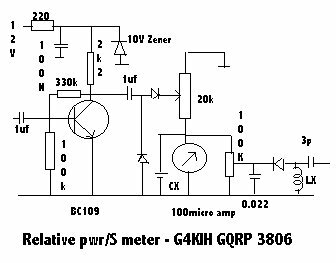 Note: the input 1uF of the 'S meter' goes to the input of the audio amplifier, and the pick up for the relative power meter is a direct connection the transmitter output. This article was originally published in Sprat 57.